Hours M-F, 8:30 a.m. to 4:45 p.m.
As temperatures rise, not only are we spending more time outdoors, but we’re spending more time exposed to biting insects. Some bites are fairly harmless, while others can be pretty dangerous. How do you know when to see a dermatologist if a bite is harmful? Dermatology Associates of Virginia has some key points to let you know when it’s time to head to their offices after an insect bite. The most common types of bug bites in the United States are from mosquitoes, fleas, ticks, bedbugs, biting flies, mites, bees/wasps/hornets, spiders and fire ants (AAD). Usually, when these bites occur they are minor enough to heal on their own without any discomfort. If there is discomfort, a topical hydrocortisone cream or other steroid ointment can usually alleviate any pain. Sometimes, bites may itch or cause a minor allergic reaction. Taking an oral antihistamine, such as Benadryl, to combat the itch can also help. In some cases, a minor bite can be more serious. Especially if an individual has been bitten multiple times. The American Academy of Dermatology suggests that an individual go to the ER as soon as they experience any difficult breathing, an inflamed throat, swollen facial features, chest pain or a racing heartbeat, dizziness, vomiting, headaches, or a rash. These are signs that a bug bite has turned into something more harmful. A visit to a dermatologist is crucial if an individual experiences a bug bite, and subsequently feels abnormally tired, has headaches, body aches or rashes. To best avoid insect bites, covering up any exposed skin during outdoor activity can help. Staying away from buggy areas or using insect repellant can help with the amount of insects an individual is exposed to. Food is also a leading reason why bugs may seek out humans. Don’t invite pests to stay by keeping food away from areas with bugs. If having food outdoors is a must, be sure to cover all food. Lastly, use screened in windows and doors to enjoy the warmer weather and block pesky insects from your living space. 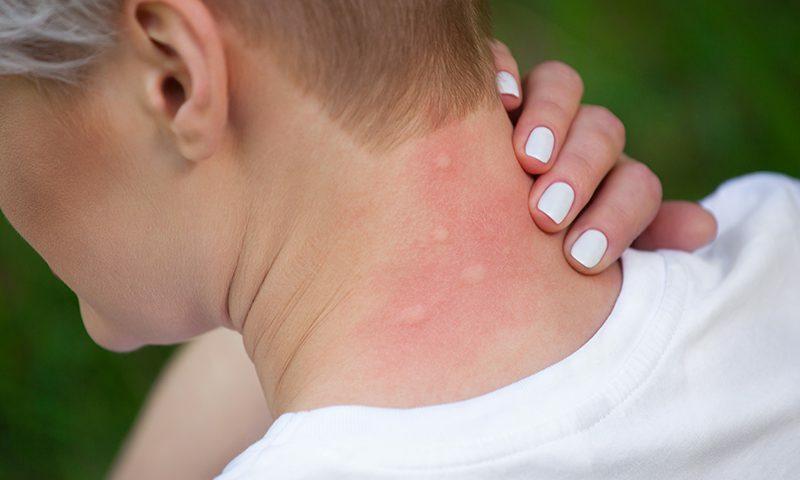 If you think a bug bite may be harmful, or are experiencing any kind of rash related to outdoor activities or bug bites, see a doctor as Dermatology Associates of Virginia. Questions about a bug bite? Call Dermatology Associates of Virginia at 804.549.4040.